It's purple week! We are starting off with Robert Oster Purple Rock. I purchased my sample of ink from Vanness Pens. Purple Rock is one of those inks that looks a little bit different on every paper. On the Col-o-ring it looks more medium purple. 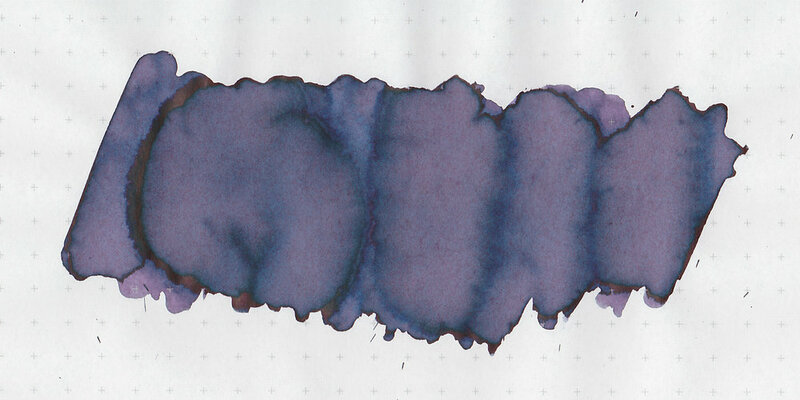 In large swabs the ink turns looks more of a dusky blue purple. There's just a little bit of pinkish red sheen on the edges. The sheen is not visible in writing. Bleeding: Low, mainly in the flex nib on Tomoe River paper. Other properties: medium shading, tiny sheen, and no shimmer. On 20 pound copy paper the ink performed well, no issues that I noticed. Ink swabs for comparison, left to right (top to bottom for mobile RSS): Robert Oster Black Violet, Robert Oster Purple Rock, and Robert Oster Claret. Click here to see the Robert Oster inks together. Birmingham Pens Alternator Crimson, KWZ Iron Gall Gummiberry, and Papier Plume Mardi Gras Indian Purple. Click here to see the purple inks together. I used a broad Pelikan M805 Ocean Swirl on Tomoe River paper. The ink had an average flow. Overall, this ink really does look different on every paper. On the Col-o-ring it's more purple, and on most other papers it's more blue-violet. It has some lovely shading and behaves pretty well. Give it a try, you might love it.